Last night, we headed up to Bowie, Maryland to meet sweet Marie and Daniel. They are as cute and funny in real life as they are in these photos – maybe funnier in real life actually. We just had a blast walking around the park. 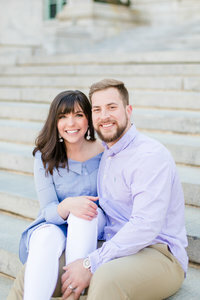 It’s been raining here in Southern Maryland all week which has caused us to reschedule a couple of our engagement sessions with some upcoming brides and grooms, but the clouds cleared and the sun came out for these two! Baltimore Maryland Engagement.